Mud Lake is one of eight bodies of water known collectively as Portage Lakes. The lakes located in this area between Akron and Canton were originally a man-made system of reservoirs and channels created in 1825 to supply water for transportation. Today Portage Lakes consists of eight lakes and reservoirs accounting for more than 2,000 acres of water used specifically for recreation during the dog days of summer. Recreation activities include boating, fishing, and swimming just to name a few. Mud Lake is a popular spot for putting in the jet-ski and blazing away in the sun. A boat dock and boat lift are a must when living on Mud Lake! For over 20 years, Metal Craft Stationary Docks have been a popular choice for residents living around Mud Lake. Stationary docks are perfect for areas where water levels fluctuate minimally during the season. Metal Craft Docks require little to no maintenance. Dock sections are modular and can be reconfigured and added on season after season. The all-aluminum construction allows for easy removal and re-installation year after year. 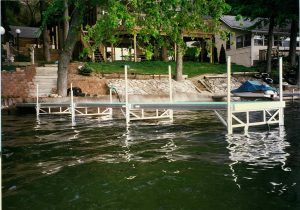 Metal Craft decking is made from aluminum extrusions with a poly acrylic finish featuring our non-skid technology providing sure footing when entering or exiting water craft. The unique heat sink technology of our extrusion provides for an ambient walking surfaces versus other docks made of plastic or wood. Metal Craft Docks are built to last with the oldest know stationary system still in use after 55 years. If you are interested in having a quality product for your lake front property, consider contacting our authorized dealer, Cornerstone Landscaping. Metal Craft also offers aluminum boat and PWC lifts for use with or without a Metal Craft Dock. We offer boat lifts to accommodate weights up to 5,000 lbs. and PWC lifts to accommodate up to 1,200 lbs. Metal Craft aluminum boat lifts feature a deep “V” design allowing entry to the lift in shallow water. Our side trussed design provides extra strength and makes entry to your watercraft easy. Standard features include stainless steel cables, nylatron pulleys, and zinc yellow coated fasteners. Additional accessories such as electric boat lift motors, carpeted side-guides, pontoon kits and fabric canopies are available for customizing your boat lift for your needs. It is important to follow the ODNR’s guidelines and restrictions on Mud Lake. Contacting Cornerstone Landscaping to discuss your needs will save you time and aggravation in determining the boat or PWC lift best for your site on Mud Lake. Metal Craft Docks has been designing, engineering and manufacturing dock systems for over 80 years! We’ve made few changes over the years in our design so even if you own a dock that is 50 years old, the parts and accessories are still available for your system! Metal Craft Docks is a family owned and operated business priding ourselves on exceptional quality, design and outstanding customer service. Metal Craft Docks and Lifts are made entirely of aluminum so they are naturally light-weight making installation and removal for winter storage easy. We are proud of the craftsmanship that goes into every one of our products manufactured in our Mentor, Ohio facility. When you purchase a Metal Craft Dock and Lift you are making an investment. We know you will be happy with your Metal Craft purchase for decades into the future! Cornerstone Landscaping is an authorized dealer for Metal Craft docks, stairs, and lifts in the Portage Lakes area. They are top rated and recognized for providing elite service by Home Advisor. Whether you are looking for a small dock or a lakefront lifestyle, Cornerstone Landscaping is your go to for Mud Lake Docks and Lifts. Contact the staff at Cornerstone to discuss your needs today at 330-882-5296 or Jeremy@cornerstonelandscaping.us.